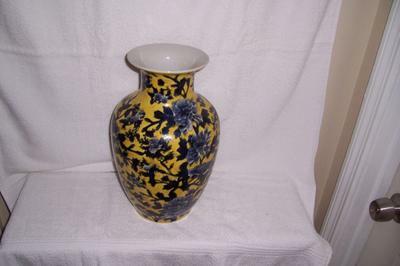 Here are better pictures of the yellow vase with blue flowers as well as the mark. Thank you for your help and it does help to date the piece. If you have anymore information available please email me. If the label is fired on, then it means that the vase is probably contemporary. 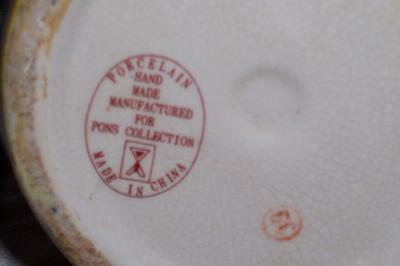 The small marking in a circle can only be found on later Chinese porcelain (not antique) and is likely some factory marking, batch marking, etc. Did you find the specific "Pons Collection"? As much porcelain is still painted by hand, in China, it does not mean anything. If it were a limited edition it might have some collecting value, but probably only of that collection itself has some name. BTW, the crackles on the bottom are not age signs themselves. During firing many items form crackles but these will remain invisible. Crackles are also artificially created. Perhaps a few decades old. Vintage at the most, I would think.